What James Likes Best by Amy Schwartz (Atheneum, 2003). A classic in the bookstogether household. James lives in the city and goes on four outings, to visit family, friends, and the fair. At the end of each story, Schwartz asks "And what do you think James liked best?" I still ask my kids this question after every outing, too. Don't Let the Peas Touch by Deborah Blumenthal; illustrated by Timothy Basil Ering (Arthur A. Levine, 2004). Gets sibling (and parent) dynamics just right. 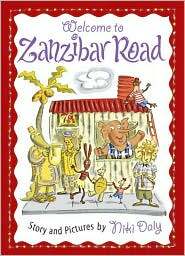 Welcome to Zanzibar Road by Niki Daly (Clarion, 2006). Mama Jumbo reminds me of No. 1 Lady Detective Mma Ramotswe. This one gets bonus points for its South African setting. We love it. These are more recent examples, but not necessarily our favorites. You might like them, though. At least as long as they keep your little ones on the couch. Louise, The Adventures of a Chicken by Kate DiCamillo and Harry Bliss (HarperCollins, 2008). Adventures feature pirates and the circus, neither of which we like. The One and Only Marigold by Florence Parry Heide; illustrated by Jill McElmurry (Schwartz and Wade, 2009). How does Maxine stand her? Can you think of any picture books with chapters to add to the list?